To best support global users and customers, enterprises require seamlessly connectivity between branch office locations, applications, and workloads hosted in the cloud. Many WAN solutions are ill-equipped for this task because they are generally rigid, complex to configure, and expensive to maintain. IoT adoption, a dramatic increase of the number of network devices, and the sophistication of security threats further compounds this challenge. Geographically-distributed devices need secure cloud connectivity, limiting the ability of existing WAN solutions to fulfill the need of distributed organizations. Cisco SD-WAN on Amazon Web Services (AWS) is an overlay WAN architecture that is designed to address modern enterprise cloud applications and workloads, heterogeneous WAN connectivity, distributed global workforces, and other business needs that traditional WAN solutions cannot meet. Learn more by downloading this solution brief. Join our webinar to learn -How to migrate a data center network to the cloud. 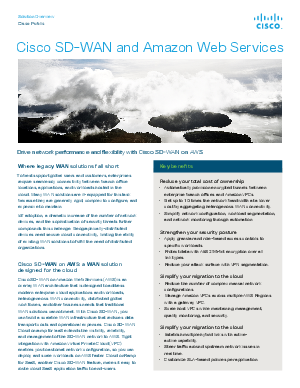 -How Cisco’s SD-WAN solution allows an organization to leverage Amazon VPCs in multiple regions via the gateway VPC implementation. -How to map multiple host VPCs to a gateway VPC and set up connections between on-premises facilities and host VPCs. -How to scale up the number of host VPCs, while isolating workloads for easier management, application quality monitoring, and security. -The benefits for network performance and bottom line costs.